Are you considering moving to one of Ontario's pretty communities, or considering relocating your family in Canada? Perhaps you are looking for a place near the beach or countryside for a family holiday or honeymoon? It is wise to learn all you can about the various places, before you decide to move here. If so, take a look at the many great Ontario communities as we explore this area of Ontario. London, Ontario, in which to settle, would be a better choice - not that I have anything against Toronto - I don’t, but it is so easy to get lost in a city of 5,000,000 people. In a smaller town, such as Kitchener (pop 414,500), Brantford (pop 90,000) or St Thomas (pop 33,236), the opportunities for housing and employment are still excellent, and you will find the people friendly and approachable. The twin communities of Kitchener-Waterloo have an interesting history. Here, in small-town Ontario, apartment buildings are not as tall, folks are more neighbourly, businesses are more accommodating, streets are not as congested, store clerks are not as busy and generally, there is not the same hustle & bustle that you get in a great big city. Some communities in Southern Ontario are geared to particular industries, for example the city of St Thomas is a thriving, energetic city with good schools, a new Hockey Arena / Community Centre, a Municipal Airport, lovely parks and lots of open spaces and great community facilities. The city of St Thomas is in the heart of Elgin County. Similarly, the city of London, Ontario is known as a "white collar" city, with head offices of the London-Life Insurance Company here and the offices of banks and other insurance companies. London, which sits on the Thames River, is the home of the University of Western Ontario and Fanshawe College. There are also Aircraft manufacturing, Auto repair & Sales, the Canadian Head offices of 3-M, the Scotch-Tape people. The Labatt and Carling beer companies were both founded here. Another one of my favourite Ontario communities is the city of Brantford which was known for many years as the home of the Massey Ferguson plant, which made tractors for the farming industry. Now with a population of 135,500 people, the pretty city of Brantford was where my family spent our first Canadian winter - for those who lived through the snowy winter of 1977-78 you may remember that there were snow drifts up to the tops of front doors during that winter. I had never seen so much snow in my life! What a shock for a girl from England's industrial north. 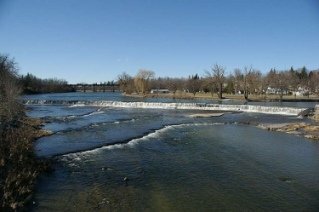 Not far from Brantford is the small town of Paris , with a population of just over 11,000, sits on the banks of the Grand River, this small town is worth a visit during the annual Cobblestone Festival. One of my favourite cities to visit in this area has always been Stratford , Ontario, on the banks of the peaceful River Avon. Like it’s namesake in England, you will find here, all things Shakespeare! Not far away from Stratford, is pretty St Marys which is a lovely town with an abundance of Limestone architecture. This is a quaint small town with an old-fashioned feel. In the summer months there are lots of activities going on in and around this community. Just to the west of London you will find Strathroy which is a community of around 20,000 people, and it is the largest community in Middlesex County. If you like Turkey, this is the place to visit during the June for their annual Turkey-Fest celebrations! This is a week-end of live entertainment, rides and fun. In the northern part of Southern Ontario you will find the community of Collingwood which is famous today for the Blue Mountain Ski Resort and much more. Not far away, at the base of the Bruce Peninsula, you will find the town of Wiarton , home of the famous White Groundhog - Wiarton Willie! Between St Thomas and Tillsonburg, on Highway 3, is the town of Aylmer where my family have always enjoyed going on Tuesday mornings, to the Farmer’s Market which is held once a week, all year round. On the main street you will find "Victorian Elegance", a store that is wonderful, both inside and out! There are two floors of Victorian Gift ware & Collectibles. In the fine weather there is also a garden and Tea Room for your enjoyment, serving light lunches, afternoon tea and desserts. With the arrival of the Cami automotive plant, the town of Ingersoll has seen an economic revival. 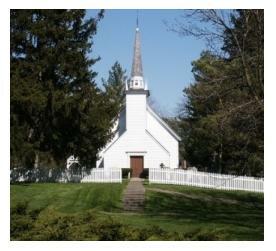 Set in the lovely Southern Ontario countryside, Ingersoll is a great place to live and work. Another pretty Ontario town is Simcoe which is south of Brantford along highway 24, and on highway 3 east of Delhi and Tillsonburg. When you reach Windsor , Ontario, you have gone just about as far south as you can go, and still be in Ontario! Set on the bank of the Detroit River, this vibrant, international city is the home of the head offices of the Chrysler Corporation of Canada. 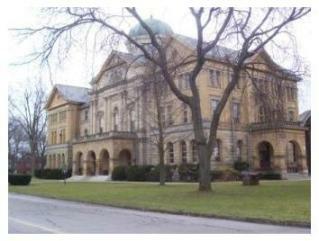 North of Windsor is the town of Sarnia Where there is much to do in the summer months! Leamington is a half-hour drive from Windsor, and is on the shore of Lake Erie, close to Point Pelee National Park and is known as the "Tomato Capital of Canada" because of the vast quantities of tomatoes grown there and processed, at the French's plant in town. This is a pretty, historic town with great limestone architecture, and the largest outdoor swimming pool in Canada! Don't miss the festivities at Turkey Fest, held each summer here in the Turkey Capital of Ontario! One of the most culturally diverse cities in Canada, located just across the river from Detroit, Michigan, Windsor is a busy University city. Want to tell us about your favourite Southern Ontario town? Is your town in Southern Ontario amazing? Do you live in a fabulous city? Here is your chance to tell everybody about it - complete the form below and we will feature YOUR home-town on our website! Your story will appear on a Web page the way you enter it here - although I do check spelling and grammar, so don't let that hold you back! Do you have a picture to add? Great! Click the button and find it on your computer. Then select it and - there, just like magic, we will add your picture to our site too. Would you like to learn how to build a site like this?